This week we’re giving you the chance to win this pretty pair of vintage flower earrings thanks to J’adore Vintage. 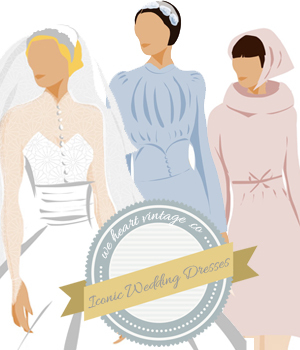 J’adore Vintage boasts a beautiful collection of vintage clothing as well as offering a styling service to help you style your special occasion: whether it’s your wedding, hen-do, prom night, girls night in or fashion show! These beautiful orchid drop earrings are approx 1970s, measure a little under 2 inches and come beautifully packaged. Let us know which of the vintage Styled by J’Adore looks below is your favourite (by commenting at the bottom of the page) and we’ll pick a winner by random after entries close on Friday 15th March. Just comment below. The winner will be announced on this blog soon afterwards so don’t forget to check back or subscribe! We will contact the winner shortly afterwards and pass their details onto J’adore Vintage who will send out the prize directly. Look 2: Vintage Glam IS THE ONE FOR ME! GREAT PRIZE! Look 3: Edgy/Rock Chick Vintage is my favorite. absolutely Look 1, it’s very 70s. really great pair of earrings!! I like the vintage glam look best. Look 3 is the one for me. Boho/Laidback Vintage is definitely for me. I’m sure those gorgeous vintage earrings would go brilliantly! Look 3: Edgy/Rock Chick Vintage is superb. Look 1: Boho/ Laidback Vintage! My future wife will look gorgeous in those! Vintage Glam is my favorite. Boho/Laidback Vintage is what I go for with a ho! ho! ho! all the way. Vintage Glam would be my favourite, its just so elegant. Edgy/Rock Chick Vintage for sure. Love that look. That would be edgy /rock vintage for me. Vintage Glam is my favourite. I like look 2: Vintage Glam. Look 3 . I’m a bit of a ‘rock chick’!! edgy/rock chick glam is the one for me! I’ve been bringing the chic to rock since the mid-nineties!!! Look 1. Boho laid back vintage always looks effortless yet beautiful…. Definitely vintage glam there’s something really special about an evening outfit that could tell tales of parties and people from generations past! Vintage glam – just so adorable! My favourite is Look 3: Edgy/Rock Chick Vintage. Vintage Glam – I was definitely born in the wrong decade. For me, it has to be the Boho/Laidback Vintage look. It’s the kind of style that attracted me to my fiancée and one she wears brilliantly. It made me fall in love! It is a highly individual style that oozes femininity and is versatile enough to be toned up or down depending on the occasion or time of day. I guess I’m somewhere between look 1: Boho/Laidback Vintage and look 3: Edgy/Rock Chick Vintage. Love ’em both! I’ve always loved the boho look. Boho Laidback Vintage – just what I love! Boho laidback vintage all the way! Look 2 – Vintage Glam is my favourite – I love ‘dressy’ clothing, modern or retro! Boho/Laidback Vintage such a great look. Look #2, vintage glam..takes me back to watching my grandparents getting ready for a big night out..cig holders and stoles. Edgy/Rock Chick Vintage is my fav, in fact has inspired me to rummage around for those stand-out pieces that can collaborate with high-street pieces to give that rocking edge to the 2012 streets of London! I like Look 3: Edgy/Rock Chick Vintage the most (although I really, really don´t like faux-suspender style tights!). Look 1: Boho/Laidback Vintage is my favourite! Beautiful! Tough choice but … Love the Edgy Rock Chick Vintage! Look 1: Boho/Laidback Vintage: I love this look best as I could see myself wearing it although I do like elements of the other looks too. Such a hard decision! Edgy/Rock Chick Vintage is definitely the look for me!! Lovely prize, hope i win! I am totally in love with look 3: Edgy/Rock Chick Vintage! Look 2: Vintage Glam. I love the look. Look 1 – I’m a big fan of big knits and florals, comfy and warm, but amazingly stylish. Love them all but if i had to pick the vintage glam gets my vote! Look 1: Boho/Laidback Vintage is definitely my favourite!! look 2 vintage glam for me! My favourite is look 2: Vintage Glam. I think it’s lovely and would definately wear an outfit like one in the pictures to stand out at a party or on a night out. I love LOOK 1 !!! The Look 1: Boho/Laidback Vintage is my favourite. I was a teenager through the seventies and loved that look, especially those dresses. Flowery, floaty and calf-length with high collars and long sleeves. Loads of lovely Laura Ashley prints. Oops ! Off I go down Memory Lane !!! I’m inspired & loving look 3, Edgy/Rock Chick Vintage. I’m not quite sure that it would fit in with my day to day activitys but is by far the best loo. Love Look 1! Boho Laidback vintage.